Does your business space or office need a facelift? Tired of staring at the same boring wall or generic artwork everyday? Interior wall graphics can brighten any room. 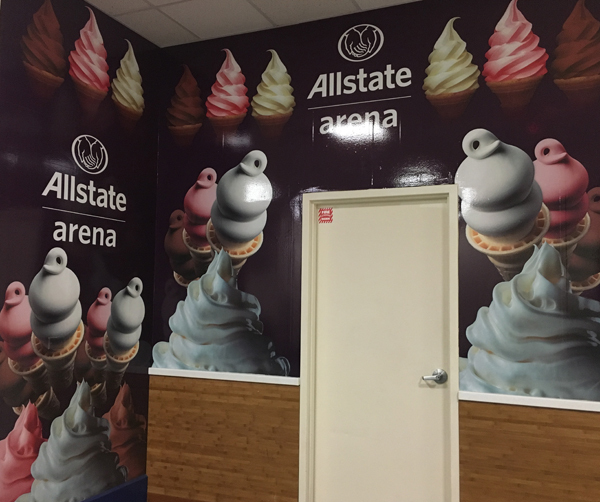 Just take a look at what we did for Allstate Arena. 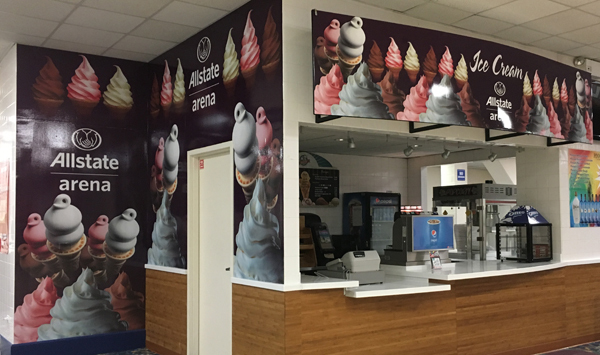 Bring new life to your business space with top quality wall wraps. Contact us or call (630) 289-7082. Take Advantage Of The Space Like car or truck wraps for business fleet vehicles, implementing a wall wrap or sign takes advantage of space that’s already yours. You might decide to do this for several reasons. One might be to emphasize your brand image. Another might be to transmit a specific message and link it to your brand. Is there any doubt about what’s going on here with this signage? Unlimited Possibilities The great thing about wall wraps is that virtually any type of image or logo can be displayed. For example, that dull office wall might look great with a forest or beach backdrop to please the eyes. Or maybe you want to blast out your brand’s logo to make sure nobody forgets you. The bottom line is that any type of image or lettering is game. You just have to decide what fits your space and your brand personality. Our experts can help you with design details. Plan Of Action To get the best results, sit down with a design expert who will visit and take measurements of your space. Experienced eyes know what kind of images will work best to transmit your message. Wall wraps done in good taste let people know from all angles what you want to say. Vibrant Colors Our work for Allstate Arena shows what color can do for a room. High quality printing machines make this possible. Plus, expert application techniques make sure there are no unsightly creases or bubbles. You want every line to fit perfectly, even when wrapping around doorways. So make your space yummier with colorful interior wall graphics. You’ll be glad you did! For superior Chicago interior wall graphics, call Mark Your Space, Inc. Contact us or call (630) 289-7082.